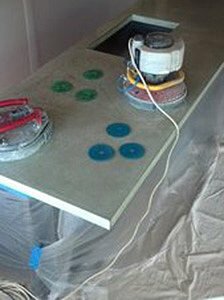 LIvingstone Concrete Studio now offers a maintenance program for all of its cast countertop work. This program is designed to keep your countertops beautiful for the life of the product. What is involved in a typical maintenance call? Depending upon the concrete finish and repairs needed, the surface is sanded or polished down, chips and scratches are repaired, and the concrete is resealed. How long should a maintenance call take? Just a few hours for light maintenance. However, a complete kitchen refinish could take up to 3 days. When should a maintenance call be scheduled? An appointment should be scheduled when your countertops have lost a little of the original luster and show a fair amount of scratches and wear. Once sealed, the surface will take a few days to reach full strength. The best time to schedule a maintenance call is when you plan to be away for a couple of days. We charge $80 per hour for the service, plus materials and travel to the job.